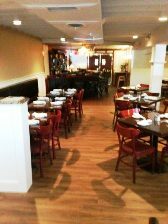 Gregory's Restaurant can host on-site parties of 10 to 80 in our beautiful dining room. From sit down to buffet we can provide a wide array of food choices and an open or cash bar if desired. So, if you're planning Baby or Bridal Showers, Wedding Rehearsal Dinners, Wedding Receptions, Funeral Luncheons, Birthday Parties, Staff Work Parties, Senior Citizen Groups, or any party of your choosing, Gregory's is the place for you. Contact our Banquet Manager, Carrie Gregory, for more information, at 609-927-6665, Tuesdays to Fridays, 9:00am to 2:00pm. Gregory's also offers off-site catering through Elite Fleet Catering Services for home parties or BBQs, or for larger events held at lodges, firehouses or other halls. Elite Feet Catering has catered many affairs throughout the surrounding community such as the Grand Opening of the AtlantiCare Surgical Center, Brandall Estates, supper clubs at the Gateway Playhouse, as well as the FAA Tech Center. We have catered weddings for as many as 200 guests, intimate cocktail dinner parties to backyard graduation and barbeques. Elite Fleet will plan and execute a spectacular event that will truly be memorable. Click here for Elite Fleet Catering.